This spiky, edgy bob cut is also very flattering to Catherine’s face accentuating her features with super-trendy style! The bob is cut in medium layers to chin length, with sharply textured ends creating the attractive prickly finish! The side parting adds to the geometric theme and the fringe is expertly graduated and styled into defined strands across Catherine’s forehead. The fabulous balayage colour really lifts this style into another category! The base is a rich medium brown with beautiful honey-caramel highlights accentuating the amazing movement in the piecey strands radiating from the head! The highlights match the lightest shade in Catherine’s brown eyes creating a unified colour scheme. The trendy outward movement produces extra volume at the sides making the hair look thicker. 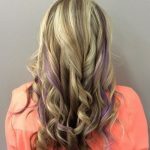 This is an excellent style for fine hair and great for an eye-catching, summer makeover!